Daniel Lindemann is described on air as an “unexciting German guy”, with his serious expression and calm tone. Although Daniel Lindemann may not seem like a humorous person, it is clear that he is someone who makes people smile with great care and prudence. 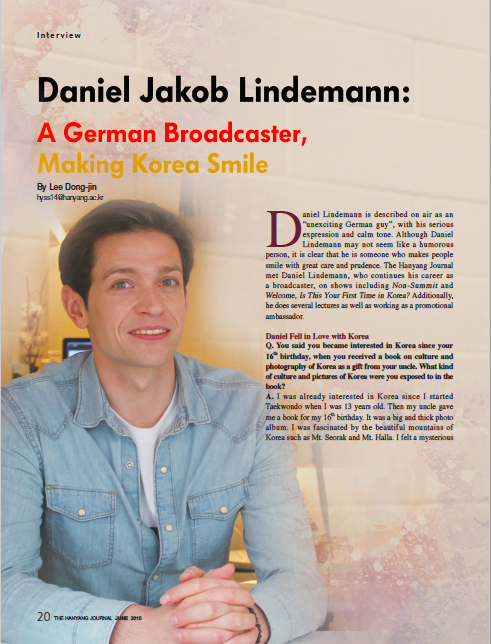 The Hanyang Journal met Daniel Lindemann, who continues his career as a broadcaster, on shows including Non-Summit and Welcome, Is This Your First Time in Korea? Additionally, he does several lectures as well as working as a promotional ambassador. Q. You said you became interested in Korea since your 16th birthday, when you received a book on culture and photography of Korea as a gift from your uncle. What kind of culture and pictures of Korea were you exposed to in the book? A. I was already interested in Korea since I started Taekwondo when I was 13 years old. Then my uncle gave me a book for my 16th birthday. It was a big and thick photo album. I was fascinated by the beautiful mountains of Korea such as Mt. Seorak and Mt. Halla. I felt a mysterious beauty in the pictures of Gyeong-ju and Seoul. Since I lived in a small village in Germany, I had never seen pictures related to Korea, so it was an eyeopening experience. Therefore, I decided to major in Korean when I went to university. Q. I heard that you first came to Korea in 2008 as an exchange student to Korea University from University of Bonn in Germany. What are some differences between German and Korean university cultures? A. They are very different. The culture of college festivals in Korea was the most interesting of all. The drinking culture is very different, too. In Germany, drinking a glass of beer on the grass is common, but in Korea, people drink until they get drunk. The drinking culture such as MTs and Korean drinking games were amazing as well. Even the dormitory culture was different. In Germany, even if you meet someone you do not know in the dormitory, you can say hello and talk to him or her. But in Korea, they just do a small greeting. Q. This is the 10th year since you first came to Korea. You have attended graduate school in Korea, worked as a marketing consultant, and recently, you have been doing various activities including broadcasting. Considering such factors, why did you decide to settle down in Korea? A. The biggest reason seems to be my friends. I have a lot of friends including those who came from the University of Bonn in Germany with me, those whom I met at Korea University, and those who did Hapkido with me. Another reason is that I can make the best use of my Korean Studies major. Also, I like Korea because there are so many different kinds of seasonal activities. For all these reasons, I do not want to leave Korea. Q. Korea is still unfamiliar to foreigners, and I think there is a cultural difference be t w e e n K o re a a nd Germany. What was the most difficult part of your early life in Korea, and how did you overcome this hardship? A. First of all, it was awkward to live in a big city. Also, it was hard to live in a ‘goshiwon’ because it was so noisy. The fine dust in Seoul was also tough for me. However, despite these difficulties, I was able to overcome it easily with mindset that as hard as it is, there are so many good things, and that there are some things that do not fit in everywhere. Studying and preparing in advance helped me a lot. Q. It is hard to talk about Daniel Lindemann without mentioning JTBC’s Non-Summit. What made you appear in Non-Summit for the first time? A. An e-mail suddenly came from the Non-Summit production team during my graduate school years. I had a meeting for about an hour and started appearing in the very next episode. At that time, I did not know how difficult broadcasting was, so it took time and a lot of studying to adapt to it. I started off with a light heart. However, as time passed, I felt responsible for it. I was worried about being a German representative. So I decided to continue appearing in the show because it had a good purpose, and had a strong attraction in both its entertaining and informative aspects. Q. You jumped to stardom in a short period of time through Non-Summit . How does it feel to live as a ordinary person in your country and as a famous person in Korea? A. In fact, it is still hard to believe. I wonder why people are interested in me. When I have been working all day and am about to go to sleep at night, I find my daily life amusing. I felt very curious when someone first recognized me and gave me a handshake on the subway after shooting Non-Summit. Life as such has always been tense, but it is so fun. My German friends do not care much. My mother simply thanked me for being her son, unchanging from the past even after I got famous. Q. You said on a radio show in September 2014, ‘I quit my job because I was busy and wanted to do something else.’ Did you have any special reason to give up your previous job and to focus on broadcasting? A. Back then, many people criticized me, by saying that, ‘Daniel wants to be an entertainer.’ But there was a practical reason as to why I quit. At that time, a new law was enacted that said that Korean companies should have five Korean employees to issue one foreign working visa. At that time, my company had only four Koreans, so I could not get a visa. Also, because our company used a performance-based pay system, it was meaningless to do broadcasting while working. I could not concentrate on my company work because of the broadcasting schedules. Q. I heard that you had an experience of introducing Korean culture to the German people by appearing for a German broadcasting company, ARD, last February. I am aware that Korean culture is not well known in Germany. How did you feel about it? A. I was surprised that ARD, the largest public broadcaster in Germany, offered me an appearance. It was an honor to speak with famous German journalists, and it was also meaningful because it was an opportunity to introduce my favorite country, Korea, to the Germans. For example, on the appearance of a bear and a tiger at the Pyeongchang Winter Olympic’s Opening Ceremony, I wasable to explain the Dan-gun myth to thepublic. It was so rewarding to help them understand the not so extravagant but splendid beauty of Korea. Q. You are often described on air as a ‘boring German man’. What do you think of this characterization? A. In Non-Summit’s Christmas special, I imitated Yu Se-yoon’s famous individual skills, ‘Baboon’, and I got charactrized as an unfunny person for the first time. I like the character because not only is it funny for everyone, but it also makes me comfortable for not having to make people laugh with much effort. The stereotype associated with Germans not being funny is due to German humor, which has a lot of punctuation and ambiguity, also specifically related to the German language. So, it is hard for foreigners to understand German humor. Q. You took part in a lot of discussions on Non-Summit, but it was impressive how you were able to express your opinions in a calm manner, even when the atmosphere was overheated. How are you able to maintain this attitude? A. First of all, there seems to be a rational German emotion. As a person who loves to exercise, I think it is a virtue not to express a lot of emotions. It is also a part of my personality to which I do not like to be loud. It is often said that a person has two ears and one mouth for listening twice and speaking once. I think that a discussion is not to win against the opponent, but to find the best answer together. It is arrogant to think that my opinion is right, and I think that I should respect my fellow debaters because people have different backgrounds, which seems to lead to differing attitudes. Seodaemun Prison and the Demilitarized Zone (DMZ) with your German friends in Welcome, Is This Your First Time in Korea? And participated in the ‘Korea History and Real-time Keyword Search Project’. You showed your deep interest in Korean history, and I wonder why you have been showing deep interest in Korean history? A. As I majored in Korean studies during university, I was interested in Korean history because while there are so many surprises in modern history, and there’s also a lot of regrettable and sad parts too. I’ve been studying it ever since then. And the fact that Koreans have a lot of interest and knowledge in Korean history is also one of the reasons. I do not agree that Korean people are not interested in history at all. For example, more than 80% of all history lessons in Germany are not very interesting because they deal with post-World War I. Then Germans do not know about the history before World War I. However, Koreans know about their whole history even though it is relatively brief. I am very interested in talking about Korean history and I’m grateful for the people’s interest. Q. You have a wide range of hobbies, including playing the piano, Hapkido, Taekwondo, soccer, and dancing. What motivated you to have such diverse hobbies? A. I have been working out with music since I was young. There are many similarities between music and exercise. Martial arts are just like ‘art’, so it̓s fun to learn many things while comparing them at the same time. It is especially great because there are many hobbiesthat can be done in Korea since thereare seas and the mountains. However students and office workers find it difficult to keep up with their hobbies because of tests and working overtime. I think people would be happier if they could relax and have separation in their lives from work with their hobbies. Since Korea is changing, I think these situations will change soon.